Apple’s acquisition of Beats is generating a lot of buzz for every reason you can think of. While Beats’ paid subscriber count is certainly not what made this an attractive buy, its headphone unit makes money, and the fees Beats pays for streaming music rights are rock-bottom, making Beats, along with its music industry centric team, an attractive buy, even at $3 billion and change. Like we reported last week, Apple plans to leverage Beats headphone design toward improving build and sound quality across the board. That is sure to benefit future ear-pod designs, whatever they may be. Forget that humor, look at tim cook, Tim Cook is a painter, I should call him to paint my property. This is less of a humour and more of a truth. That's the best way, to make this new acquisition tank. I personally have no use for em, my LG Bluetooth works fine. I use em primarily for the gym. Good luck with beats Apple, but no thanks. I also using an LG stereo Bluetooth, HBS700 and HBS730. Personally I prefer HBS730 sound better, clearer, more details and 3D depth can be perceive. My friend that like bass thinks that HBS700 is better for him. No, no. In the first picture the price tag should be $29, because that is how much they are actually worth. Paying $299 for Beats is already over priced. I travel for work and decided to try them over my personal choice of Bose. I already IMEI2 but wanted noise canceling, Beats noise canceling and sound is well below Bose. I now have both QC15 and QC20 for my iPhone 5 and Note 3. I will assume Apple bought them for streaming rights and using upgraded ear buds in iPhones and iPods. Koss Porta Pro's, your welcome. From an objective perspective, we all know that some of the writers here at PA don't exactly do as much research as they should when it comes to ANY of the platforms on some of these articles that are written. This article definitely rings true to the nature of both companies here (although probably not to the extreme price jump shown after Apple acquisition). 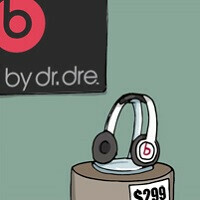 Truth - Beats are overpriced for the quality of headphones that they are compared to what they claim to be. Apple marks the price of their products and add-ons well above what their competitors do. i.e. Going from a 512GB SSD to 1TB SSD on a MBP is $500. Comparably, the same storage capacity jump on a Windows machine is only a ~$200 difference for an SSD. That's always been the way the Apple has (over)priced their products and people have always made fun of their pricing scheme and the people who've paid the ridiculous overcharge for something that should only come at a fraction of the price. Now of course on any article about the "insert platform here," there will always be the uber-fanboys that cry foul because something was misrepresented in an article or blown out of proportion or just plain wrong. Just as you guys came in crying fowl on something that's been known as a pretty common practice for Beats and Apple - overpricing. Dark, you were pretty objective at one point. Now you're teetering back on the edge of fanboyism. I can has the Darkkjedii back that was posting last year? Luxury items will always skew capitalist principles because the items fall into the want category and not the need category. People will pay for the Vuitton bag prices because it's a want more than a need. People with disposable cash flows will often purchase want items more likely than need items. It also explains why the iPhone only dominates in the US and Japan. In countries where disposable cash flows are not as common, the iPhone sales are poor. Apple knows this and prices their products in the luxury side of things. Their consumer base believes they are buying the best money can purchase so they don't care, and some use their purchases as status symbols like the Vuitton bag. This is not old news. i think u meant "this is not new news" how people derive their value is highly subjective,you make it sounds like apple consumer base are all wrong in their value perception.galaxy phone and iphone has the same huge profit margin (but galaxy phone generally worth nothing in very short period of time),if you really into value u should buy nokia $20 bucks feature phones. Both the iPhone and the Galaxy phones are overpriced. As for the resale value, that is a risky reason to purchase a cell phone. Consumer choice could change tomorrow and the resale value some people count on could vaporize instantly. There's also more value than just $20 feature phones. You sound offended by that. Get over it. And you think they aren't? suggest me an "underpriced" alternative to the "overpriced" S5 or iphone 5s and...i wonder why people say they are overpriced?because some fella do a tear down of the phone component and say it cost the manufacturer just pennies to built? can u buy all the components and built an iphone 5s out of few pennies yourself? Cyanogen's new phone, Moto X, Nexus 5, many of the Nokia phones. It's really not that difficult, you just have to put your bias aside and look with open eyes.